This work of art called « seen » was made by Banksy in 2006 . We can see two policeman who are catching a yellow graffiti . Maybe , it was made in England because the hat they are wearing looks like The one on the English polices uniform . The letters are shining and look stronger than the two men . 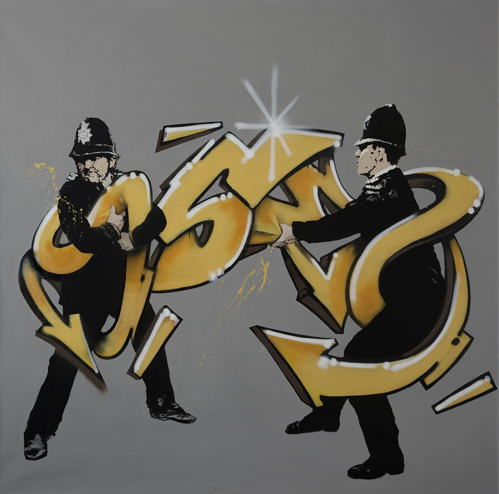 This work art’s meaning is that the police of the uk . Forbidden the street artists to express their feeling through their art , but despite the rules , they do it . The yellow letters are lighter than the rest of the art , which makes them more important . The scene looks like a battle between the policemen and the yellow graffiti . One of us thinks it’s weird because there are two styles and doesn’t looks like a graffiti . Another one thinks that what rules are not respected . The third agrees with the graffiti - Everyone has their freedom to do what they want to do . And the last just thinks that it’s good that someone did a graffiti to show his feelings and how the rules are unfair. Le 20 mars 2017 lors de ma rencontre avec le maire du 13e j’ai appris qu’une , nouvelle œuvre allait être réalisée, on peut désormais la voir finie et elle se situe dans le 13e arrondissement de Paris Boulevard-Vincent Auriol. J’ai également appris qu’il ne paye aucun artiste du moins pour la prestation (il leurs paye le matériel) .Le maire pense qu’il est possible pour tout le monde de faire du street art en allant dans des endroits spécialisés pour ça, atelier. Nous lui avons posé la question que représente le street art pour lui et il nous a répondu : « il s’agit d’un mouvement pictural du 21eme siècle ». Le maire a décidé de ne pas travailler avec le même artiste plusieurs fois sauf Obey qui a fait trois œuvres et aussi C215 qui en a fait plusieurs aussi. Il a décidé de mettre beaucoup d’œuvres Boulevard Vincent Auriol car il y a le métro aérien qui passe par la et donc on peut avoir un aperçu des œuvres. Selon lui le street art est bénéfique culturellement. On the left and one the right we can see policemen who try to catch the graffiti . The clothes of the policemen are black and the letters of the graffiti are yellow . We think the black color is dark and worrying whereas the yellow looks more friendly . Emilie’s feeling(s) : « I like it , I find the picture the picture of this graffiti is beautiful because street art fights of its liberty » Benjamin,Sophie and yisheng quite like the picture because they didn’t really like the style of street art . -Il s’agit de son idée, mais, si les habitants décident d’élire un autre Maire personne ne sait ce qu’il fera par rapport au Street Art. -Il y a une nouvelle œuvre, Boulevard Vincent Auriol, il essaie de toutes les regrouper au même endroit. -Le coût pour faire venir un artiste est entre 0 et 2000 euros. Il nous a dit qu’il ne payait pas les artistes, mais le monsieur de la galerie nous a expliqué qu’il payait les artistes 2000 euros. Mais le plus cher était le matériel ( nacelle si c’est un immeuble, la peinture…). 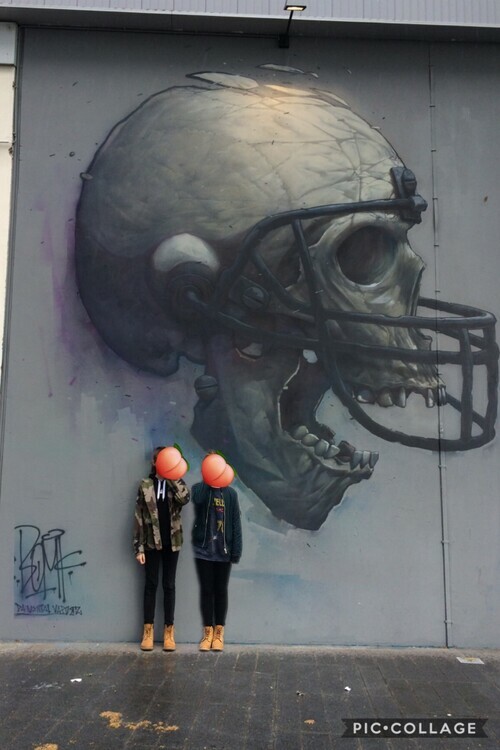 This work of art was made by Bom.k from the group of street-artist « Da Mental Vaporz”. It’s a mural made on one the walls of “Galerie Itinerrance” () Avenue de France. We can see a protective gear for baseball which seems screwed on a big skull, several teeth are missing, and the skull is a bit chipped. The middle top of the head is lighting while the sides are darker. The artwork is really realistic and beautiful, that’s principally the reasons why we chose this artwork. First, let’s talk about the protective gear. In the field of baseball, it’s used to protect the players. But there, we are not sure if this is a player’s head, so we can interpret it just like a simple defense system. Plus, like we said before, this gear is screwed on the skull, which is like connecting the defense and the brain, and let we think that the gear is created by the brain. Finally, if we look at the skull in details, we understand that it’s not a teenager’s, and looks like an old people’s skull. So, it can mean that the sort of protective gear that our brain builds will follow us until our death. In conclusion, we think that it can be a sort of metaphor to show us the defense we create by ourselves from our birth, and which follow us our whole life. Jade’s: I’m completely fond of this graffiti, because like we said before, I find it beautiful and I admire the artist’s work, the coloring is really amazing! I can’t tell how Bom.k did it, if he used stencils plus spray paints or something else, anyway this is just awesome. graffiti because the hidden meaning is more or less interesting.